Enjoy this treat from the archives! 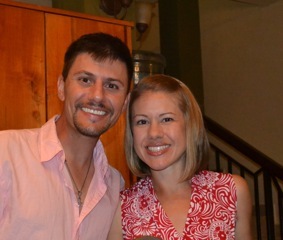 Kristin Byrnes is originally from Yakima, WA, and her husband, Billy Byrnes, from San Jose, CA. Prior to serving as volunteers with Volunteer Missionary Movement they worked as Associate Campus Ministers and Religion Teachers for seven years at rival Catholic high schools in San Jose, CA. Currently they teach English at the Instituto Publico Carolina Camas Araúz and support the work of the Catholic parish in rural San Nicolás, Nicaragua. Billy also works twice a week in the nearby community of La Garnacha, where they are famous for their organic garden, livestock, and Nicaragua’s best swiss cheese. Read more about their joys and struggles at www.billyandkristin.tumblr.com. 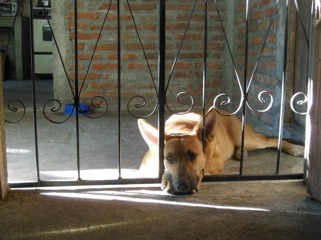 Our days begin early, and not just because our dog likes to pounce on our bed at 5:30am, challenging the strength of our mosquito net and pleading with us to help him welcome the new day. 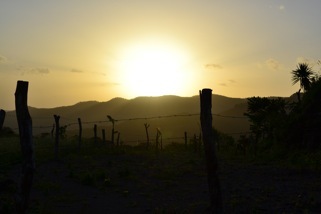 All arise early in the campo. We must get a start on the day and take advantage of the cooler morning temperatures to take care of daily chores. 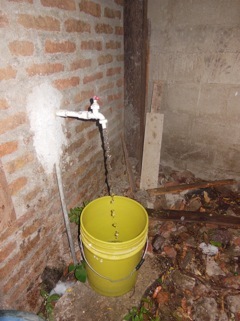 Water only comes on for a few hours a day, in the morning, so we have to fill the appropriate buckets and water tank that has a prominent place in our backyard, to ensure that we have water throughout the day. We then take turns sweeping away the layer of dust, dirt, and dog hair that has inevitably accumulated overnight and blankets the floors. Often we wash clothes in the morning so that the blazing sun can beat down on them throughout the day, drying them easily by mid-afternoon. We take turns finishing other chores and when one of us has a free moment, we head across the street to chat with Doña Victoria and buy her fresh, right-off-the-grill tortillas. It’s a challenge not to sample this steamy treat as we walk back to our house, but they must last for lunch and dinner. By 8am, we are at the school preparing for the classes ahead. Billy teaches the first and second year classes; Kristin the upper three grades. Resources are thin to non-existent, so we have been challenged to grow as teachers in both our flexibility and creativity. We compete for the students’ attention, but there are rare days in which a struggling student finally grasps a concept or another student shares what is really going on at home. These are the days we treasure. After the school day ends, we are back home around 1:30pm to make a quick lunch and launch into various afternoon activities. 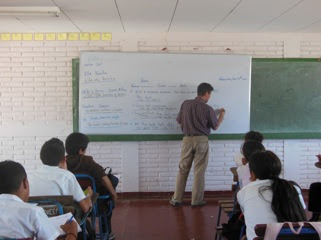 Twice a week, we hold English classes in the afternoon at school that open to anyone who is interested in coming. Our class is primarily current students, a few teachers, and alums. There is always a family to visit and numerous tasks to complete on our computer, such as preparing lessons. Most recently, we’ve been hunting down the “perfect” English song for each class to learn and compete with in the upcoming months at the department level. Word has spread through town that Kristin likes to cook, so numerous pizza and bread-baking parties have taken place in our tiny kitchen. 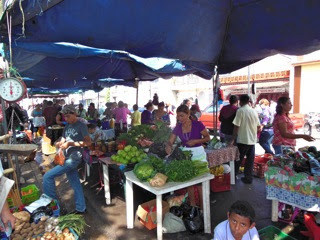 Billy travels on Thursdays to La Garnacha to help prepare and then sell vegetables at the Farmer’s Market held in the neighboring “big” city of Estelí on Fridays. Our weekends only differ in that we teach Theology instead of English, and it is done at the parish instead of the school. Sometimes we will make a trip out to a more rural community, walking over an hour to share in their Sunday prayer services with them. Mostly we worship with the community in San Nicolás on Sunday mornings at the church. As the sun begins to set each day and the temperatures start to cool down, the town comes alive. We will walk through town, greeting neighbors, perhaps buying a few things to cook for dinner, and catching up with friends. Often we will pray after returning from our walk and then begin dinner preparations. Billy is usually the master-mind behind dinner and Kristin does a great job cleaning dishes afterwards. Catching up with family and friends at home, the most recent world news, or burying ourselves into our current book is usually how we spend the evenings. We eventually head to bed, knowing that the smiles of our students await us the following day. The Volunteer Missionary Movement USA is an international organization of lay Christians based in Milwaukee Wisconsin. 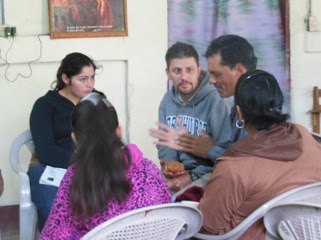 VMM USA recruits volunteers from across the country in the Catholic social justice tradition to collaborate with partners in Central America working in a variety of occupations for peace, social justice, and human empowerment of the poor and marginalized to promote equality, empower sustainable human development and challenge unjust and oppressive social structures.